There might be queues aplenty on iPhone launch day on Friday 9 November, but there certainly won't be a shortage of phones. Sources close to Apple say the company is nearly doubling the number of iPhones it's making ahead of Christmas from the originally planned 1.54 million, to a staggering 2.7 million. That's presumably to meet rising demand from the US following the $200 (£98) price cut in the iPhone's price there, while also satisfying eager iPhone buyers in the UK, France and Germany. If the increased production numbers are true, then Apple will have also busted its own stats for the whole of 2007, with 4.8 million phones to be built, compared to the 3.6 million it had originally predicted. 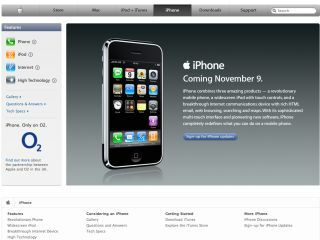 Apple says it hopes to sell 10 miillon iPhones by the end of 2008.